I think it hit me the first time I tried a Berg Käse while living in Germany. There was a cheese cart that was in the square every Saturday that offered up a variety of tastes and smells unlike anything I had ever experienced before. The creamy textures coupled with the earthy aromas is something that has stayed with me to this day. Ever since then I have been interested in cheese in some form or another. I eat it..I cook with it…I have even started making it at home, just to try and understand it a bit more. So that’s what this is about. What I eat, what I drink it with, and what I make will be chronicled here. Good luck with the blog bro! So glad you decided to do this, looking forward to trying out your wine/beer cheese combos and hearing about authentic cheese! Are you going to have different focuses by region, style or is it going to be more random? Regardless, I am very excited you will be sharing your knowledge with us, congrats! I think the subject matter will evolve, the more that I explore and get to know the cheese world and local community. I plan on incorporating regions and styles as well as the artisan’s approach, my own approach at home, and the lessons that are learned from that. There is a wealth of knowledge out there so I am looking forward to finding my way! (obvious in reading your posts). I am writing a book, Making Home-crafted Artisan Cheese, to be published by Ten Speed Press next summer. My book covers formulas for both long-time favorite cheeses and 20+ from or inspired by our leading artisan cheesemakers. Your experience and journey would be fun to weave in.I would love to incorporate something from/about you as a passionate cheesemaking ‘hobbyist’. Interested in participating in a traditional publishing format? 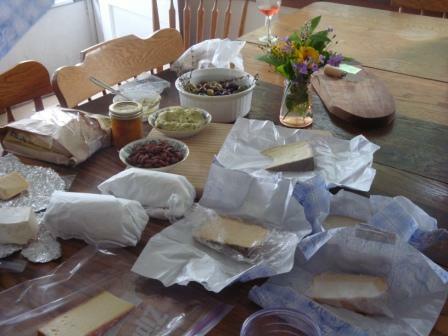 Very nice blog and it looks like alot of fun, and work both making the cheese and keeping up with the blog. Good luck and I will be following your ventures. Good Luck with your cheese career bro! I have added you to my blogroll and hope you will do the same. Just found you and am so glad I did. A fellow fromagephile! Adding you now to The House Mouse blogroll so come on over and check it out. Maybe add this li’l mouse to yours?